This article first appeared in The Edge Financial Daily, on July 3, 2018. 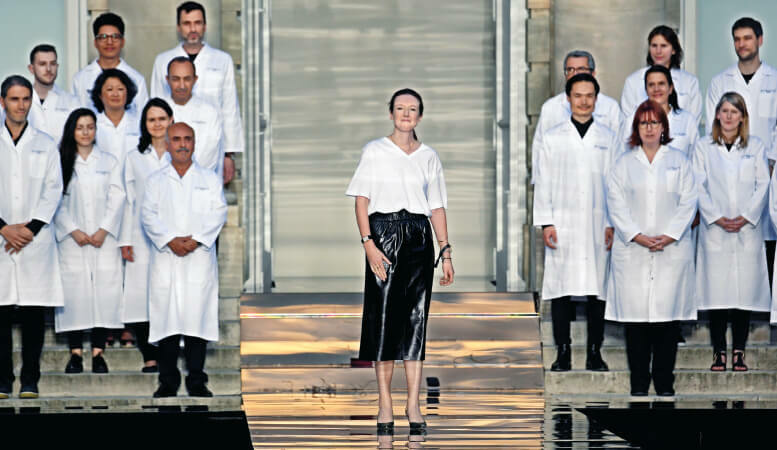 Keller (centre), the fashion designer of Givenchy, acknowledging the audience at the end of her 2018-2019 fall/winter haute couture collection fashion show by Givenchy in Paris on Sunday..
To the sound of Givenchy’s muse Audrey Hepburn singing ‘Moon River’, the models strutted down a catwalk that shimmered like a river. CLARE Waight Keller, the Givenchy stylist who grabbed the global fashion spotlight by designing Meghan Markle’s wedding dress, paid homage to the storied house’s late founder in her latest haute couture collection. On the first day of Paris couture week, the Givenchy show, held on Sunday in the gardens of the National Archives in the city’s Marais district, was shrouded in mystery and old-school Hollywood glamour. It was Keller’s first show since the house’s founder Hubert de Givenchy died in March at the age of 91. To the sound of Givenchy’s muse Audrey Hepburn singing Moon River, the models strutted down a catwalk that shimmered like a river. Draped dresses, voluminous jewels and feathers dotted the collection — 47-year-old Keller’s second haute couture offering since she succeeded Riccardo Tisci at Givenchy in March 2017, shortly after leaving rival label Chloe after six years at the helm. The colour palette was essentially black and white. Regal capes abounded — sometimes short, sometimes sweeping, sometimes hooded. Gem-coloured sequins covered some dresses, evoking mermaid scales. Even the masculine silhouettes also sparkled with sequins. The British artistic director created the boat-necked, sculpted dress that Markle wore for her wedding to Prince Harry on May 19, featuring a 5m train embroidered with flowers from all 53 Commonwealth countries. Markle also chose Givenchy for her first official engagement on June 14 alongside Queen Elizabeth II, sporting a beige wool crepe dress with a small cape. The official haute couture programme includes 35 shows, running until tomorrow, with collections from 11 nations: Belgium, China, France, Israel, Italy, Japan, Lebanon, Morocco, The Netherlands, Russia and the US. Unlike ready-to-wear shows, haute couture roll-outs in January and July are a solely Parisian affair. The prestigious “haute couture” label is accorded by the French industry ministry to acknowledge traditional craftsmanship in hand-sewn, custom-made garments using strict criteria. Only 14 fashion houses currently boast the recognition, including Chanel, Christian Dior, Giambattista Valli, Givenchy, Jean-Paul Gaultier, Maison Margiela, Schiaparelli, Alexis Mabille and Stephane Rolland. The catwalk displays of some of the world’s most expensive clothes will be followed on Thursday by high-end jewellery collections by the likes of Anna Hu, Bulgari, Chanel, Chopard, De Beers, Dior, Louis Vuitton and Mikimoto. Off the official programme, fashionistas on Sunday were treated to a show of exclusive creations by Sonia Rykiel, the fashion house founded by the influential French designer who died in 2016. 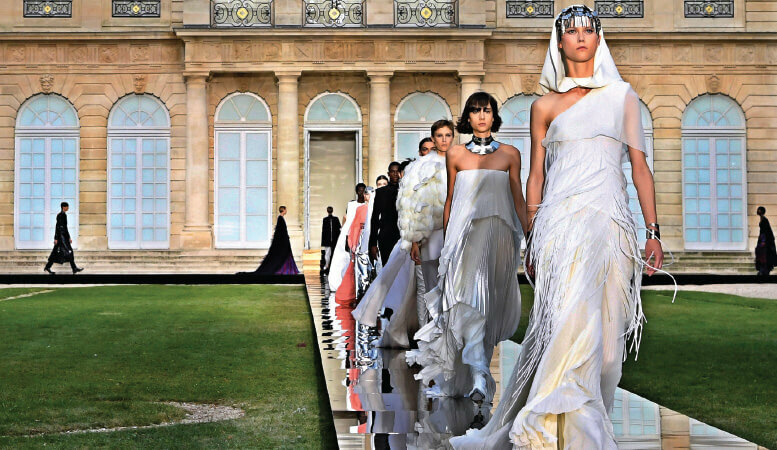 Although the house develops ready-to-wear lines, it worked up handmade, limited-edition items to mark its 50th anniversary of the show in the elegant courtyard of the Ecole des Beaux Arts. Artistic director Julie de Libran paid homage to some of the label’s classics, with trademark mesh, black contrasted with bright colours, and lots of sequins and embroidery. See-through black tulle skirts were paired with big coats or wool pullovers, while a wedding dress was worn with jeans.